You may not have heard of J.B. Jackson, but his impact on railroad photography has been profound. In the Winter 2017 issue of Railroad Heritage®, Alexander Benjamin Craghead takes an in-depth look at Jackson, his path-breaking work in geography and landscape studies, and his influence on how we view railroads. 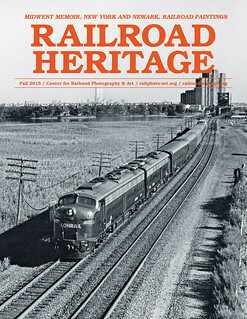 That includes the work of Jeff Brouws, noted author, photographer, and Center board member, whose view of the ex-Wabash coaling tower in Decatur, Illinois, appears on the cover. Howard Fogg’s paintings of the Pittsburg & Lake Erie Railroad anchor the issue’s other feature article, strikingly set against contemporary photographs of the same scenes by author Jerry W. Jordak. You can read all about our first regional conference, Conversations Northeast, in a review by Steve Barry, editor of Railfan & Railroad magazine. Jordan Radke, archives manager, returns for his regular Out of the Archives column, this time delving into copyright and other matters of intellectual property. With Switzerland’s new Gotthard Base Tunnel coming into regular operation in December 2016, Arjan den Boer’s regular column on European rail travel posters looks back at some of the advertising of the original Gotthard Railway. John Gruber offers a tribute to Hal Lewis, who died in 2016 and whose collection resides in the Center’s archive. You can also read a book review, letters from our readers, and an introduction of Peter Mosse, our newest board member. Celebrate the 100th anniversary of the National Park Service with an in-depth look at the relationship between the Great Northern Railway and Glacier Park in Montana. Author Justin Franz shares an engaging story, lavishly illustrated with his own contemporary photographs and historic images from the unparalleled collection of GN historian Scott Tanner. Artist Charlie Hunter shares railroad paintings and commentary about what he has dubbed “contemporary realism” from an exhibition he curated for Vermont’s Brattleboro Museum. Author David Lester provides thorough reviews of our sold-out Conversations 2016 conference in Lake Forest, Illinois, illustrated by Hank Koshollek’s photographs, and an announcement of the Center’s new endowment fund. Finally, Jordan Radke explains the Center’s redesigned website in his regular “Out of the Archives” column. 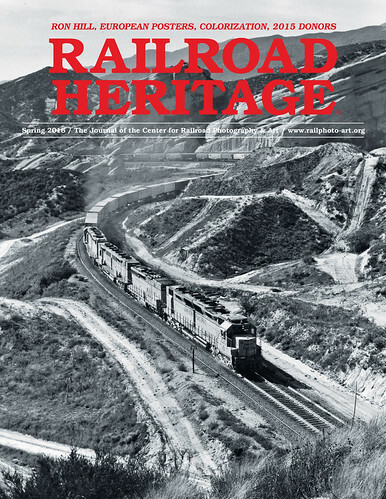 Get ready for our annual Conversations conference with the Spring 2016 issue of Railroad Heritage. Author, photographer, and board member Jeff Brouws provides a preview of one of the conference presentations with his in-depth look at the photography of Ronald C. Hill. We then travel across the pond to Europe where Arjen den Boers of the Netherlands introduces railway posters from central Europe in the early twentieth century. Davidson Ward offers a brief glimpse into the world of digital colorization of old photographs, while editor Scott Lothes shares some industrial archaeology from New York’s Hudson River Valley. Jordan Radke continues his popular “Out of the Archives” column with a look at processing work and guidelines for submitting your collection for consideration to the Center or another archive. And we gratefully list our donors from 2015, the people who make the Center happen. 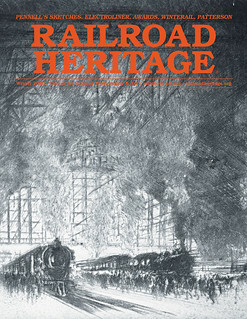 The Winter 2016 issue of Railroad Heritage boasts sixty pages of content, including five feature articles. Professor Betsy Fahlman examines the remarkable 1919 series of railroad etchings by artist Joseph Pennell. Kevin Keefe profiles photographer, writer, retired railroader, and 2016 conference presenter Steve Patterson. Elrond Lawrence looks at the thirty-seven-year history of the Winterail railroad photography show and its lasting influences. We announce the winners of the 2015 John E. Gruber Creative Photography Award, and Gruber also presents the art of the North Shore’s popular Electroliner trains. The new “Out of the Archives” column continues with its second installment by looking at scanning and digital files. 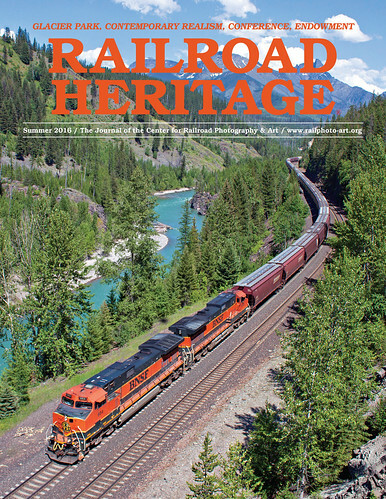 The Fall 2015 issue of Railroad Heritage includes three main features, plus a new column. Photographer Victor Hand shares a gallery of his work from around New York City. 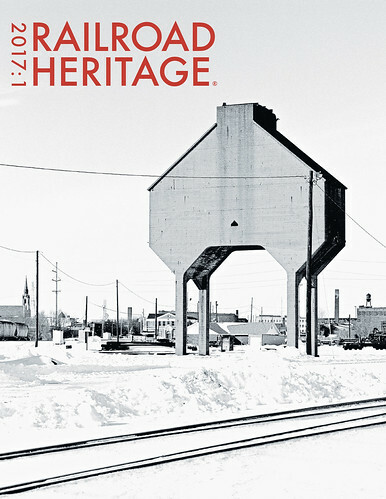 There’s a memoir and photographs by Charles McCreary about growing up around trains in the Upper Midwest. Peter Mosse recasts his 2015 Conversations presentations with an in-depth look at the first hundred years of rail art, drawing from his extensive collection. To keep you better apprised of our archiving work, we launched a new column with this issue, “Out of the Archives.” The first installment looks at organization and metadata from the work of our two summer interns in Madison. This issue is out of print. Get in touch with us about digital copies.